We normally don't write about my running exploits much. I've only been running again since the end of April, and it hasn't been the most consistent running plan on the face of the Earth considering all the nursery stuff and house buying stuff we've been doing as of late. Nonetheless, I've not let it sideline me completely on the running front. For me, running is a release, an escape much like hiking from the rest of the world and a little time to focus on me and keep myself fit. After all, we've got another one on the way and I'll need to be in shape to keep up with her. Anyway, an opportunity arose to test how far I've come since I started running again. 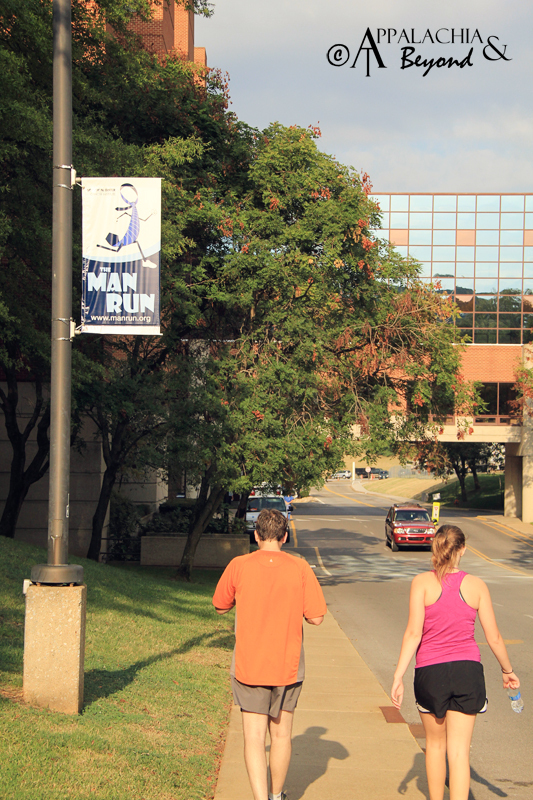 Where I work was the headline sponsor for The 4th Annual Man Run against prostate cancer. Being such, the race organizers gave work so many spots in the race for the employees. So I decided to run. In addition, I signed up the kiddo to run since they had enough spots to accommodate her as well. I figured if she was going to run cross country this year, this would be a good chance to introduce her to the 5k distance. I had promised Robin earlier that I wouldn't leave the kiddo behind during the race. That being the case, my only goal was to finish the race together with Ashby. After arriving at the race and being led to the starting line by the bagpipe troop, it was time to get the race underway. The gun went "pow" and Robin got our pictures as we took off. The start was a bit cramped and it took about a half mile before the pack thinned out. The lack of training definitely took it's toll on the kiddo. I don't think we made it half a mile before I looked over my shoulder and saw that she had fallen behind and was walking. I stood there and waited for her to catch up to me. 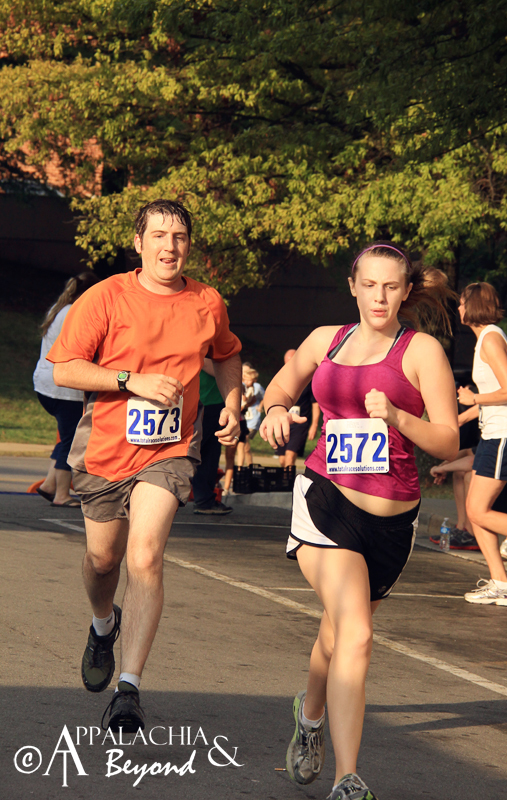 From there it was a mix of walking and running to the finish with the ratio being more favorable to the walking side. It was a beautiful day to walk and run with the kiddo. So we walked up all the hills that remained and jogged down the other side of them. Kiddo had a number of issues during the race that we had to overcome. Fortunately, she's not one to give up. We were coming up on the 3rd mile and drawing closer to the finish line. The volunteers along the route couldn't have been better. The let us know how good of a job we were doing and how close the finish line was. We continued to alternate between walking and running for the last mile as kiddo's limits would allow. We were both determined to finish this thing strong and together. It was in the final straight away that I said "come on let's go and finish this thing", and she said "hang on I'm trying to muster what I've got left." I replied, "we'll be finished before you're done mustering." I grabbed her hand and started sprinting. She took off at that point like a bullet out of a gun, and I hurried along behind her. 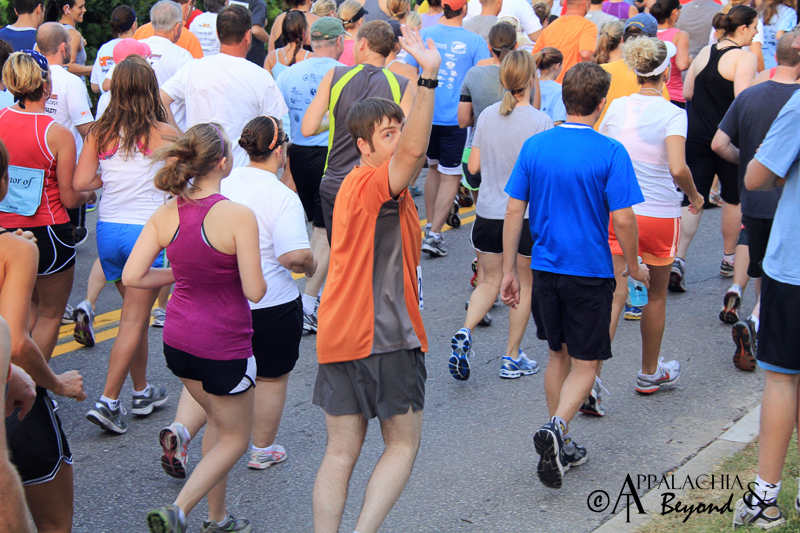 Across the finish line we ran as the announcer spoke, "Ashby Bird, Timothy Bird." Robin was there snapping away on the camera capturing the moment forever. I couldn't have been more proud. 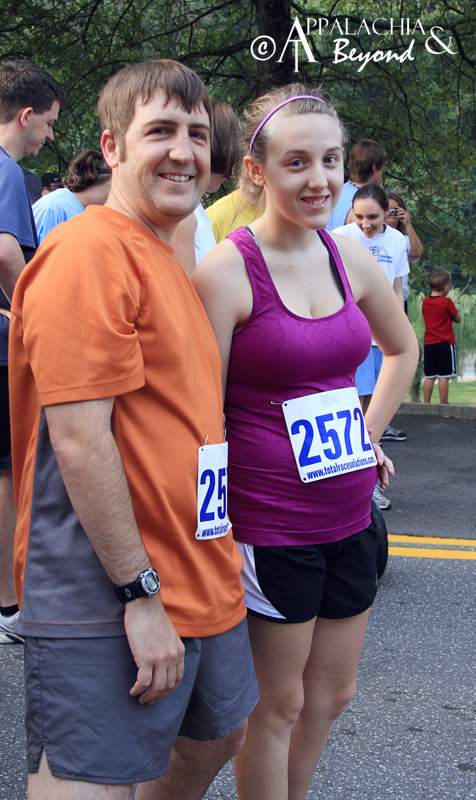 My girl just ran/walked her first 5k and in doing so discovered that she was not meant to be a long distance runner. I'm okay with that revelation. Had it been a week or so prior I might have been disappointed in that. However, Robin in her infinite wisdom, reminded me that our daughter is not me, and I shouldn't try to live vicariously through her. She is her own person and she prefers to run shorter distance sprints on the track. Robin was right as usual, and it reminded me to support her no matter what. If I don't, I would only end up pushing her away. She may not run distance, but she is still running track later in the year. She knows that she needs to get to training before the track season gets here. So I look forward to taking her to the track and helping her train for the 400 and 800 meter sprints as well as the long jump. I have no doubt that she will dominate her events. By the way, after the race we got our results as totalracesolutions.com was used to time the race. It was rather surprising to see that kiddo's effort was enough to garner her a 3rd place finish out of 5 runners in her age group. Go Ashby! None of us thought anything about the possibilities of placing and left shortly after the awards ceremony started. I've set my sights on another race in October (The Coalfield 5k) which happens to be part of the Run and See Tennessee Grand Prix.. Ashby said she would proudly stand on the sidelines with Robin and cheer me on. I've got a great family, and I am truly blessed. P.S. By the way, I thought I'd mention that the Mindbenders I got from Vasque shoes earlier in the year did a wonderful job keeping me light on my feet. I totally love those shoes.